NEW YORK (CNN) -- An investigation commissioned by the city of New York found private gun vendors selling weapons to buyers who admitted not being able to pass background checks, breaking federal law, a report released Wednesday says. It is illegal for unlicensed sellers to sell a gun if there is reason to think the buyer would fail a background check. 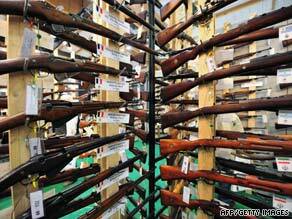 The sales were made at seven gun shows in Ohio, Tennessee and Nevada, the report says. Hired investigators with hidden cameras were able to purchase guns from private sellers after announcing to the vendors they could not pass a background check, it says. Nineteen of the 30 private sellers the undercover investigators dealt with failed the integrity test, according to the report. The law does not require private unlicensed sellers at gun shows to do background checks on their customers. However, it is a federal felony for unlicensed sellers to sell a gun if they have a reason to believe the buyer would fail a background check. There were no arrests and no lawsuit were filed. "Closing the gun show loophole has nothing to do with the Second Amendment," Mayor Michael Bloomberg said in a news conference Wednesday. "It is basic law enforcement, plain and simple." He said he does not want to shut down gun shows but to change the law. He cited a 2000 study from the then-Bureau of Alcohol, Tobacco and Firearms saying 30 percent of guns involved in federal illegal gun trafficking investigations are connected in some way to gun shows. The figure is disputed by gun proponents. "We believe anyone who breaks the law should be arrested, prosecuted and punished," the National Rifle Association said in a statement supplied to CNN. "Instead of working with law enforcement to bring those who may have broken the law to justice, Mayor Bloomberg chose to use this information for a press conference. Bloomberg's priorities are clearly media first, justice later." But Bloomberg has support from some in Washington, including Sen. Frank Lautenberg, D-New Jersey. "This investigation reveals how easy it is for criminals and even terrorists to purchase firearms at gun shows and is further proof that we must close the gun show loophole," Lautenberg said in a written statement.